This week, I have for you not a formal article, but a short series of flash reviews of some of the awesome parks Chittenden County has to offer. Regrettably, at time of writing, I don’t have pictures of all these great parks, so this will become a link to the post where I include those missing photos. First up is a spot about ten minutes’ walk (with no hills) from the Ben & Jerry’s Scoop Shop on Church Street lies Battery Park. The Park sits on a bluff overlooking Burlington’s harbor, with benches and vistas and magnificent sunsets. There’s an outdoor stage and a playground, and its elevation over the water means that there’s almost always a wonderful breeze coming straight from the Adirondacks. Perhaps the best part, though is Beansie’s Food Bus, which is always in the same place: adjacent to the Battery Park parking lot. Beansie’s is a cash only food truck in a retrofitted school bus with great food and killer prices. A family of four could purchase a comfortable amount of food and drink for under $25. They even have soft serve, though I didn’t include that in this $25 asessment. City Hall Park is just off Church Street (on the other side of City Hall itself, across Main St from the Flynn Theatre), and a great place to cool off on a hot, sunny day. We do get those up here, and City Hall Park is full of shady trees that’ll help beat the heat. Not only that, but an organization called Burlington City Arts has organized a series of free concerts running through the end of August, held in City Hall Park. On the line that divides the distinct municipalities of Burlington and South Burlington is a park very popular among those college students whose favorite Ben & Jerry’s flavor is “Half Baked.” Oakledge Park is both bigger and more secluded than either Battery or City Hall Parks, with water access (not beaches, exactly) and various sports courts. Ample parking and Bike Path access make Oakledge an excellent place to begin a bike adventure or wander in lakeside woods for a while. 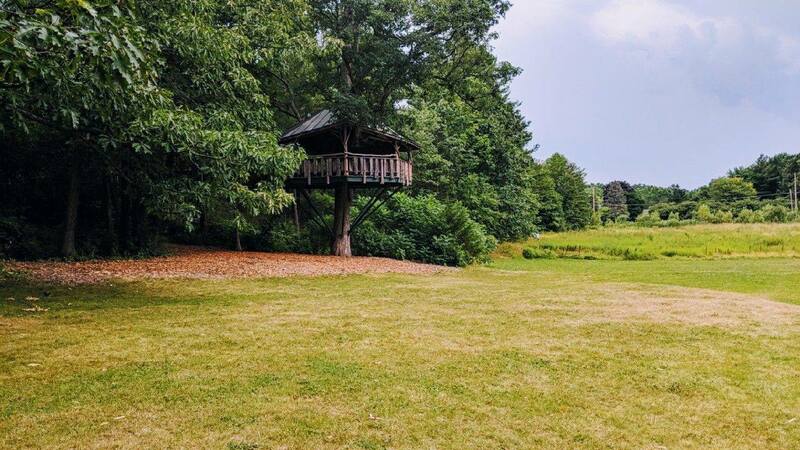 My personal favorite feature, though, is a ramp accessible treehouse overlooking a small, quiet meadow (the main picture on this article). It’s a wonderful place to relax, as it’s usually pretty quiet. The Casavant Nature Area in Winooski is my final park of interest. It has more in common with a State Park than city parks like Battery or City Hall, and is less developed than Oakledge. It’s also my favorite among these parks, despite the parking situation being a bit…limited. If you pay hourly for parking in the Winooski Parking Garage, you’ll have easy access to a wide clearing ideal for playing with sports equipment or dogs or relaxing under a starlit sky. To find it, just follow the river upstream; you can’t miss it. From the clearing, a trail runs along the river to a place where I-89 crosses the ravine the Winooski has formed. Incidentally, the river has formed a pool here, which makes it a wonderful place to swim on a hot day. Do be warned, though: the Winooski is fed by water off the Green Mountains, so even early in the summer the water consists mostly of frigid snowmelt. This time of year, though, the water should at least be tolerable—if not downright refreshing. As I mentioned before, Casavant has fairly limited parking. There’s a gravel lot on VT-15 with a trailhead leading right to the overpass and swimming hole. It is possible to loop back, if from the overpass, you walk with the flow of the river. This will take you in the direction of the clearing and downtown Winooski. Getting back on 15 is quite easy; just walk uphill. Stay upstream of Winooski’s big roundabout and turn right (east) on 15 (away from the traffic circle) to get back to the little lot at the trailhead. My apologies that this went up so late this Sunday. I was out all day researching next week’s article: an easy to find spot that’s perfect for jumping off cliffs (and into water).